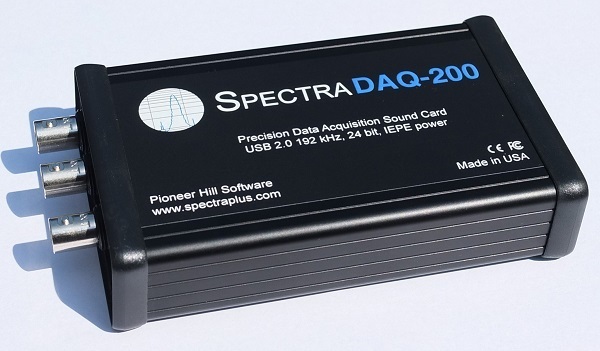 SpectraDAQ-200 module was custom designed for use with SpectraPLUS-RT and SpectraPLUS-SC. It uses the highest quality data converters for exceptionally low noise and distortion, has fixed gain steps for easy calibration to your transducer sensitivity, IEPE power for accelerometers or microphones, and incorporates standard BNC connectors widely used in test environments. Up to 24bit/192 kHz sampling Dual channel IEPE (4ma constant current) power for accelerometers and microphones Fixed gain steps (+/-10V, 2.5V, 625mV, 156mV) BNC connectors Digital I/O lines for process control solutions Excellent performance (very low noise floor and distortion) Small rugged portable steel case USB 3.0 (cable included) Fully USB Bus powered - no external power supply required For two channel acoustic and vibration signal measurements - this device does it all!